The SCReader-OEM is a contact smartcard reader module compliant with ISO7816 and EMV L1 specifications. Very compact, this module is perfect for integration in other products such as vending machines,kiosks, voting machines, ID verifiers... Built around an INSIDE SECURE AT90SCR chip and ABC SMARTCARD EMV L1 stack, this module larger systems to easily access all types of cards through an on-board or external smart card connector. Firmware can be customized by the user for an easier integration. The multiple GPIOs can be customized to add extra IOs for specific application (LCD, Keyboard, power switch relay). 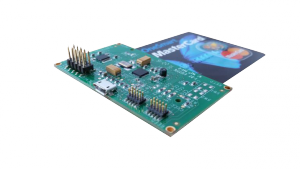 ABC Smartcard can also customize this module to meet your application.